This recording of early Irish harp music is recorded on a facsimile copy of Ireland's only surviving medieval harp: the 14th/15th century Trinity College Harp. The programme on this CD reflects the music played on the Irish harp in the 17th and 18th centuries. The main focus is the music of the Irish harper composers Ruaidhrí Dall Ó Catháin, Cornelius Lyons and Turlough Carolan together with tunes collected from harpers of the period. The Irish harp was known and well regarded outside Ireland at this period. This recording also presents several pieces of English 17th century court music of the kind which may have been played by Irish harpers working at the Stuart court in London. A previously unrecorded prize-winning young sean-nós singer, Bríd Ní Mhaoilchiaráin, sings four songs on the record. These items are either traditional songs that were also played by harpers or harp compositions which were later turned into songs. The recording straddles the interface between early music and traditional music. It marries almost unique specialized technical expertise with an educated understanding of the aesthetics of 17th and 18th century Irish music to produce a convincing picture of the extraordinary sound world and repertoire of the early Irish harp. As an Irish musician and also one of Europe's leading historical harpists, Siobhán Armstrong is ideally suited by qualification and experience to make such a recording. She is one of only a handful of professional harpists worldwide who research and play harps of earlier centuries. She works with many of the main early music ensembles and conductors in Europe and the USA. She founded and chairs the Historical Harp Society of Ireland and is encouraging a revival of the playing of Ireland's historical harp both within Ireland and abroad. This recording marries almost unique specialized technical expertise with an educated understanding of the aesthetics of 17th and 18th century Irish music to produce a convincing picture of the extraordinary sound world and repertoire of the early Irish harp. For more information, please visit www.siobhanarmstrong.com. Bríd Ní Mhaoilchiaráin is a native of the Connemara Gaeltacht (Irish speaking region) in the west of Ireland. A prize winning sean-nós (Irish for ‘old style’) singer, she won her first competition at the age of nine. Her family is steeped in the tradition of old Irish song: Bríd learned her store of songs from her mother, Barbara Éinniú, who is a niece of the legendary sean-nós singer, Joe Heaney. Bríd won first prize in the all-Ireland sean-nós singing competition, Corn Uí Ríoda, in 2002. She also represented Ireland at the 2003 Panceltic festival at which she came first in the solo singing competition. She was invited to be singer-in-residence at the National University of Ireland, Galway in 2003, and in the same year, she represented Ireland at the Festival Interceltique de Lorient in Brittany. You can support the activities of the Historical Harp Society of Ireland by ordering this recording on-line at www.irishharp.org/shop/. The Gaelic harp is one of the most ancient instruments in Ireland and the Scottish Highlands, going back as it does at least 1000 years. It is also called the cruit, cláirseach (Irish Gaelic), clàrsach (Scottish Gaelic), and wire-strung harp. As the great Gaelic civilization of Ireland and the Scottish Highlands weakened in the 1600s due to gradual English infiltration, use of the Gaelic harp declined. The tradition died in the 1800s, along with the last of the harpers. At the time, the new gut-strung harp slowly stole the place – and the name – of the old wire-strung Gaelic harp. However, since the 1970s there has been a revival of the true Gaelic harp, and Gaelic harps strung with brass, silver, and gold are once again being played. That’s what makes this CD from acclaimed harpist Siobhán Armstrong so special. Armstrong’s music and scholarship are an ongoing part of the Gaelic harp revival. Armstrong is one of only a handful of harpists around the world who studies and plays early harps. 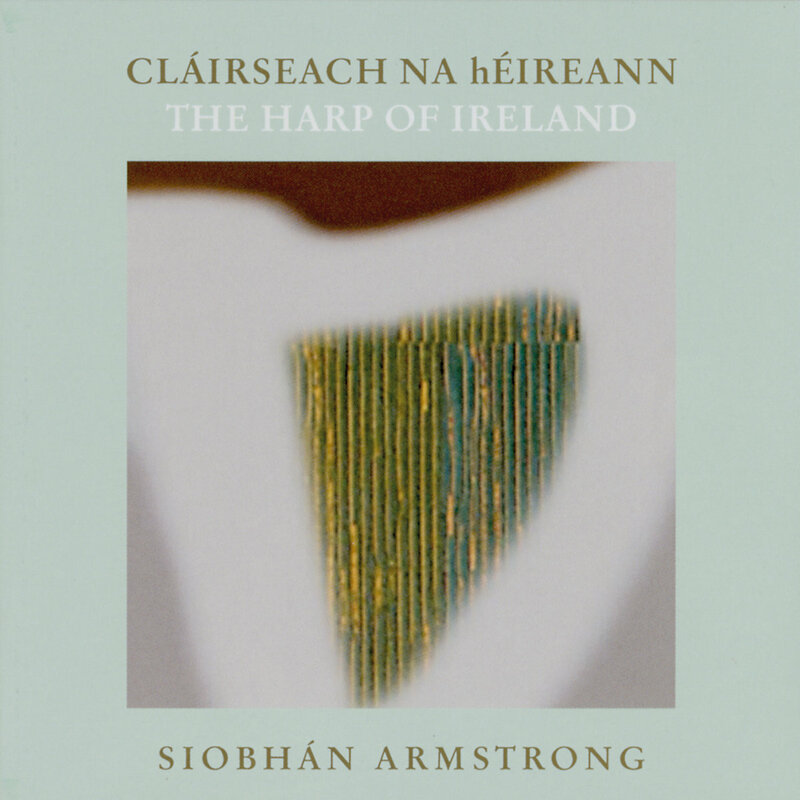 For this CD, Armstrong plays a copy of the 14th/15th century Trinity College harp, Ireland's only surviving medieval harp. Out of it Armstrong brings music meant for the soul, melodies rich and bright. The CD focuses on music of Irish composers of the 16th to 18th centuries, but also has some Renaissance English pieces, like those that played by Irish harpers at the Elizabethan and Stuart courts. The CD booklet is a world in itself, with information on Siobhán Armstrong, guest singer Bríd Ní Mhaoilchiaráin, the Gaelic harp and its history, and the tunes themselves. Singer Bríd Ní Mhaoilchiaráin is among the many pleasures of this CD. A sean-nós singer from Conamara, Bríd sings three lovely songs in Irish. This is the first recording of Bríd Ní Mhaoilchiaráin, who has won several awards for her singing in Irish Gaelic. Her Gaelic voice is a perfect match for the Gaelic harp: soulful and clear. Her last song is Seoíthín Seó, a beautiful lullaby.